Seventh Street Books, 9781633880429, 281pp. Blind psychiatrist Mark Angelotti is faced with his most troubling case yet when he is asked to evaluate Rachel Lazarus, the estranged wife of a slain University of Chicago professor. Months earlier, the professor’s body was found stuffed into one of the exhibits at “Scav,” the school’s world-famous annual scavenger hunt, and – in a feast for the press – missing a vital piece of its anatomy. Though she’s confessed to her husband’s murder, Rachel is mounting a battered woman’s defense. Forced into helping the prosecution, Mark becomes unsure of his objectivity when his investigation uncovers uncomfortable parallels between Rachel’s history and his own. That concern proves well-founded when his damaging admission at trial all but convicts Rachel. Then a tip connects the case to another suspected murder and evidence that Rachel may not be guilty after all. As he plows ahead during a brutal Chicago winter, Mark soon learns he has far more to worry about than treacherous snow and ice: someone will do anything to guarantee that Rachel takes the fall. 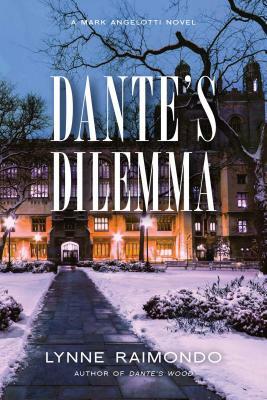 Lynne Raimondo is a full-time writer and the author of Dante’s Wood and Dante’s Poison, the first two Mark Angelotti novels. She formerly worked as the general counsel for Arthur Andersen LLP and later as the general counsel of the Illinois Department of Revenue.